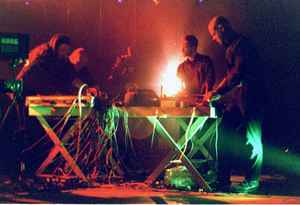 Herpes Ö DeLuxe, formed 1995, is a four piece group from Bern/Switzerland working in a musical field between atmospheric noise, electronica bruitiste, sombre soundscapes or harsh drones. Their instruments are partly analogue electronic gear, partly self-built or deconstructed tools like tape loops or turntables that are (mis-)used as rhythm machines. Live performances - electronic and acoustic soundscapes, ranging from ambient sounds and playful collages to devastating, rhythmic noise attacks - always refer to the moment. According to this, an exclusive set is elaborated for every event, no one of which is ever performed again in the same form, because the spontaneous aspect would be lost and a reproduction would be in opposition to the interactive play of the four musicians, which depends strongly on the situation of a given event. Shows are often complemented with performance elements or other actions. Besides concerts in the traditional sense, Herpes Ö DeLuxe have been involved in numerous other activities; they made the live music for the theater 'Habgier' and regularly produce the soundtracks for the 'pyrotechnical interventions' of the artist Pavel Schmidt (Solothurn/Munich). Those events usually take place in museums or art spaces. Sporadically they are also teaming up with singer Beat-Man (frontman of the well known Garage Rock/Punk-Band The Monsters). Under the name Reverend Beat-Man & The Church Of Herpes they are producing a more song-orientated brand of music, closer to the common 'pop'-scheme but with a noisy edge. They call this genre Electronic Gospel Trash.